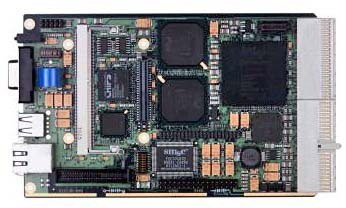 The IPM6 incorporates on a 3U form factor the low power Pentium processor (Tillamook) from Intel. The new product is equipped with numerous features and offers next to a full set of standard PC features & interfaces. Very special is the on-board connector for the Remote MMI options (REMMI) for LCD & Touch connection that supports a distance of 15 Meter. Available transceiver Technology (Parallel, LVDS & PanelLink). Unique on the REMMI-R option is the availability of 2 x PS/2 ports each on a 6-pin mini-DIN connector and a RS232 and an USB interface next to the LCD. The IPM6 is available for temperature 0°C to +60°C and optionally -40°C to +85°. All interfaces are ESD protected according the latest know-how. Special efforts have been taken on the quality of the components, their long term availability and low power consumption of the system (< 9 Watts). All these features and its reasonable cost, make the IPM6 to the ideal solution for any application where a flexible, rugged long term available complete CompactPCI board is needed.